Homemade croissants: still beautiful even before the oven. It is with great delight and an almost divine-like proclivity that we share this week’s topic with you. This is an entire post dedicated to the great and powerful pastry known as The Croissant. There’s no denying that pretty much everyone believes in the gospel of a good croissant, but personally, I’ve always been intimidated by the thought of attempting such creation in my own kitchen. When I gaze upon the perfectly symmetrical crevasses and taste the impossibly flaky, buttery sacrament of a store-bought croissant, I’m always left with feelings of gratitude for the unknown baker who created alllll those layers. This week, that person was our very own Caitlin Childs. 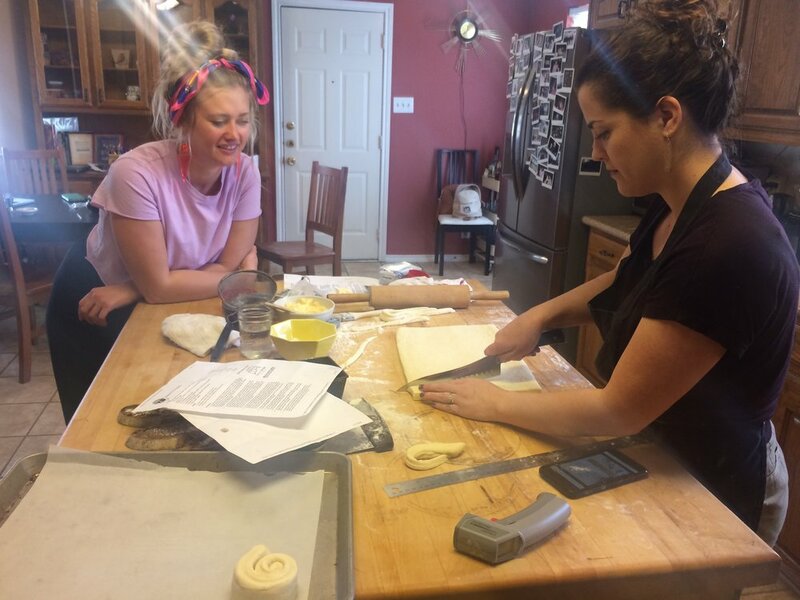 For our readers who have never met Caitlin in person, just know this woman has an insatiable passion for pastry. The way she lights up when she talks about the time her life was changed by a morning bun is reminiscent of a newly converted devotee. Her enthusiasm and courageous attitude is infectious! 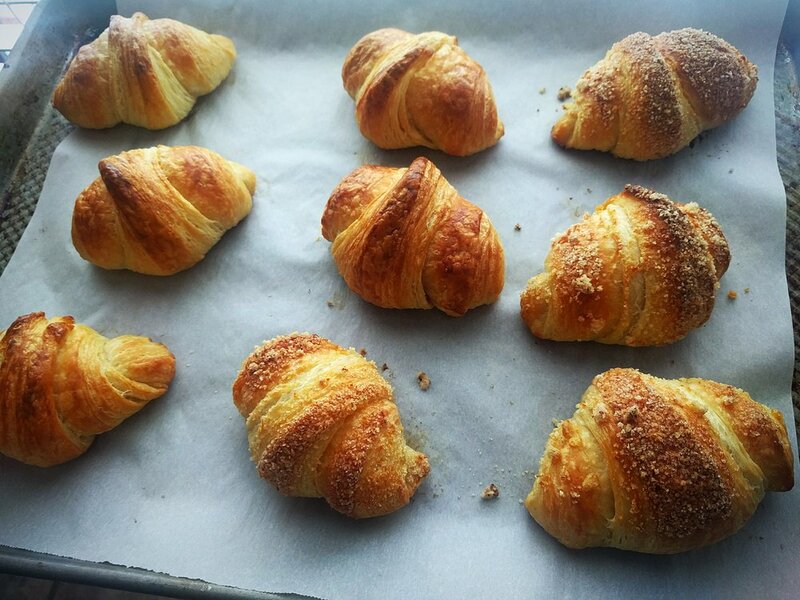 The process of making these two variations of croissant dough became an hours-long event, working the butter in, turning, laminating, and waiting...but her spirit never faltered. Caitlin holding down the lamination station. When asked what inspired her to test out not one, but two ambitious recipes for our croissant consecration she takes us back to that life changing morning bun. Morning baking is always better with friends! Our wake and bake morning turned to late afternoon and our anticipation grew as we witnessed perfection rise in that oven. All those hours of watching pale, seemingly boring dough get flipped and refrigerated started to pay off in the form of golden blooms of delicate layers. I may or may not have gotten misty eyed when I took that first bite. I realize I sound like a nut whose embellishment on this topic is damn near criminal, but I challenge you to try these recipes and see for yourself, the one true gospel that is The Croissant. Patience truly is a virtue in the baker’s realm...and buttery, flakey things come to those who wait. If you're here for the two recipes we tried, look no further, but be sure to read over Catilin's expert explanations* on lamination for best results with your own kitchen experiments! We made this recipe, only shaped like regular croissants, not the loaf thing you see here. And this one by King Arthur Flour, which, after a long morning and extended afternoon of baking, we deemed our favorite recipe of the two, even though both were great. The dough was a little easier to work with here, making for a better lamination process! Laminating dough is the process of folding a solid butter layer into dough many times to create hundreds of layers that will ultimately create steam to puff up the pastry. It's tricky, laborious, and extremely time consuming, especially doing it at home, by hand, but the reward is almost unmatched (if not just because you know how much work went into them). To make orange scented sugar, mix the zest of one orange with one cup of white sugar until thoroughly combined. Who doesn't love some good buns? To make morning buns, take approx 1 ½” wide 6” long strips of dough rolled up with the orange sugar and covered on the outside with the sugar. Once baked, toss more sugar on top and all around. We experimented a couple different ways to incorporate the sugar - before shaping, after shaping, after proofing but before baking, and after baking. I think the best application is a combination of them. You want the sugar in the middle of the roll like the cinnamon filling of a cinnamon roll, and you want that fresh dusting like a sugared donut. Written by Storie Cunningham & Caitlin Childs. Edited by courtney marie.